Central (also Central District; Chinese: 中環) is the central business district of Hong Kong. It is located in Central and Western District, on the north shore of Hong Kong Island, across Victoria Harbour from Tsim Sha Tsui, the southernmost point of Kowloon Peninsula. The area was the heart of Victoria City, although that name is rarely used today. The area of Chung Wan (中環), named Central in English, was one of the districts (四環九約) in Victoria City. 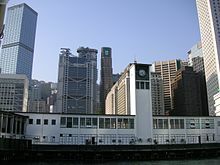 The English name Central became prevalent after the Island Line of the MTR metro system was built in the early 1980s, and the connected stations of Pedder and Chater renamed as Central. On some older maps, it and the area to its west are named Kwan Tai Lo (羣帶路) below Victoria Peak. It formed a channel, Chung Mun (中門), with Tsim Sha Tsui, on the sea route along the coast of southern China. The eastern part of Central District has been known as Admiralty since the completion of Admiralty Station in the early 1980s. The Court of Final Appeal Building, completed in 1912, once used as the building of Legislative Council of Hong Kong from 1985 to 2011. In 1904 the Praya Reclamation Scheme added 59 acres (24 ha) of land to Central's waterfront. Many of the proposals came from Sir Paul Chater and James Johnstone Keswick, the founders of Hongkong Land. During the 1920s, Hong Kong was able to push far ahead economically, because of the cohesive collaboration between Central and all waterfront commerce. There are many Grade-A commercial buildings in Central, a prime commercial district in Hong Kong. Bank of China (Hong Kong) has its head office in the Bank of China Tower. The Hongkong and Shanghai Banking Corporation, a subsidiary of HSBC, has its head office in the HSBC Main Building. Bank of East Asia and Hang Seng Bank have their head offices in Central. Jubilee Street (租庇利街). Named for the Golden Jubilee of Queen Victoria in 1887. Central Government Complex, Tamar under construction in March 2011. Edinburgh Place Ferry Pier was demolished in 2007. View of the Central Piers. Central–Mid-levels escalators at Cochrane Street. ^ Sanderson, Edgar (1897–1898). The British Empire in the nineteenth century: its progress and expansion at home and abroad. IV. London: Blackie and Son. p. 337. LCCN 02002538. OCLC 11625716. ^ "Contact Us Archived 20 August 2011 at the Wayback Machine." Bank of China. Retrieved on 11 September 2011. "Registered Office BOC Hong Kong (Holdings) Limited 52/F Bank of China Tower 1 Garden Road Hong Kong"
^ "Cathay Pacific wins award for providing a smoke-free workplace at its Hong Kong Headquarters" (Press release). Cathay Pacific. 6 January 2005. Retrieved 2 July 2009. ^ Yanne, Andrew; Heller, Gillis (2009). Signs of a Colonial Era. Hong Kong University Press. p. 8. ISBN 978-962-209-944-9.